1) Yesterday I talked about zooming in on my HUGE Canon 650D image files – the photograph above shows a screen-grab of a file enlarged just a tiny-teeny bit. Look at the holes in my nose! I swear it’s like having some kind of computerised magnifying mirror – I could go in about ten times more than this! I’m absolutely obsessed. It makes me want to go and squeeze various parts of my face with my fingernails, but I shall resist. 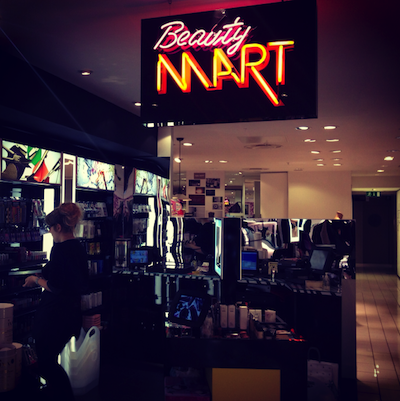 4) I popped into the Beauty Mart at Harvey Nichols on Friday and it was FAB! I expected it to be a lot larger, but in a way I’m glad that it’s not. It’s cute and very un-English. I felt as though I had entered a Tokyo boutique crossed with a French Pharmacie crossed with Sally’s on Shaftesbury Avenue. The girls at Beauty Mart were so passionate about beauty, it was something to behold. I stood there for ages nattering away about everything from hair curlers to adult acne! At one point, Emma Forbes popped over to join the conversation – she had stocked up on about five litres of Bioderma. Make sure you stop by next time you’re in Knightsbridge – they have cherry-picked from some of the best brands, including the very niche, and at the moment they have a cabinet of curiosities displaying British Beauty Blogger‘s Chanel collection. It’s a very clever, funky beauty area that offsets the more formal feel of the ground floor beauty hall. KAWAII!